The Triumph 2 Carat Round Engraved Antique Estate Channel Set Cubic Zirconia Solitaire Engagement Ring is a beautiful design that is all about the details. This fancy solitaire ring features a 2 carat 8mm round center stone that is set in a decorative four prong basket setting with a cut our scroll heart design in the gallery of the head. 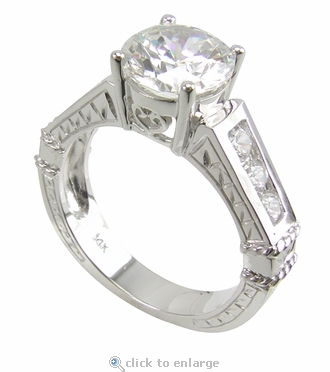 The shank features three channel set round diamond look cubic zirconia down both sides. 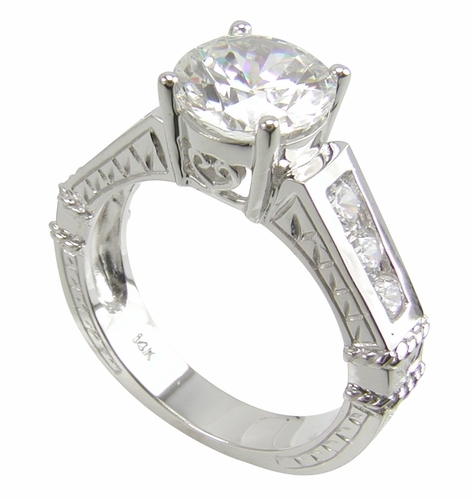 The ring also has rich engraved details, reminiscent of an antique estate style vintage look and feel. The total carat weight is approximately 2.75 carats of the finest diamond quality cubic zirconia simulants. Additional twisted rope like detailing also accents each side of the shank for that extra touch. The shank measures approximately 4mm at its widest point. Please feel free to contact us directly at 866-942-6663, Due to extremely low pricing, all clearance sales are final.